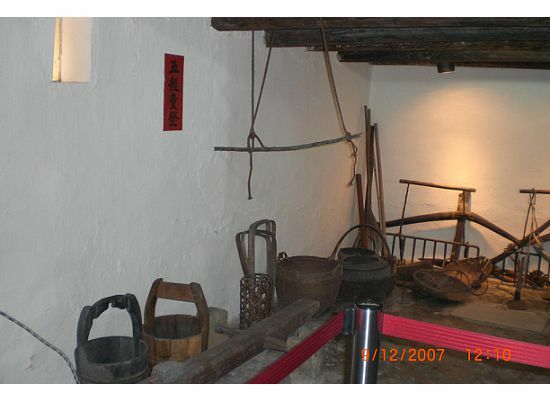 Hong Kong Law Uk Folk Museum represents the old Hong Kong as a fishing port and farming country. 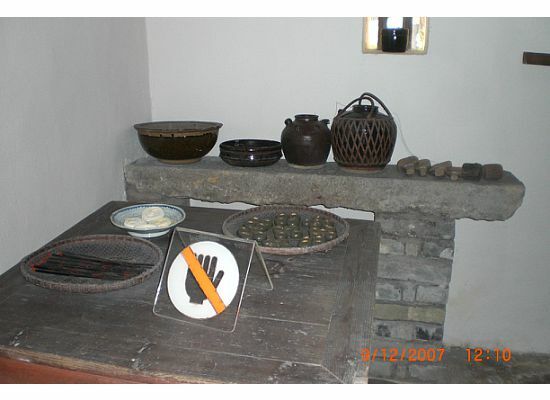 By looking at the pictures, you can see how self-sufficient Hong Kong people were. Located in a tiny local community park in the industrial area, Chai Wan, this museum is just about a few hundred square feet in size. It is less than a 5 minute walk away from the Chai Wan MTR station. My dad owned a warehouse and office in the area of the Hong Kong Law Uk Folk Museum before. It used to be a dirty developing industrial area. There are still many industrial buildings around, but mainly for warehousing. Many of them became offices. But before the development, there were many fishermen here. First, you see the front porch. Raise your head, you will see the slope of the roof helps to collect the rain water towards that area. In the Chinese culture, it represents collecting money. After that, you will see a small living room. 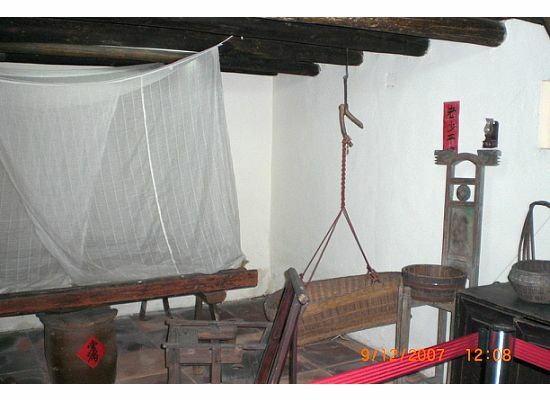 There are small bedrooms, mantle to worship the ancestors, tools for fishing, farming and stuffs for carrying out Chinese customs, such as for a wedding. The lady in the living room is wearing an old Chinese country wife's outfit. 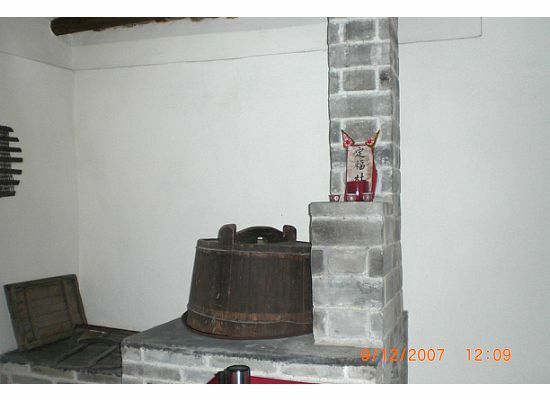 In the middle of the wall, is the mantle where the house would worship their god and/or ancestors. 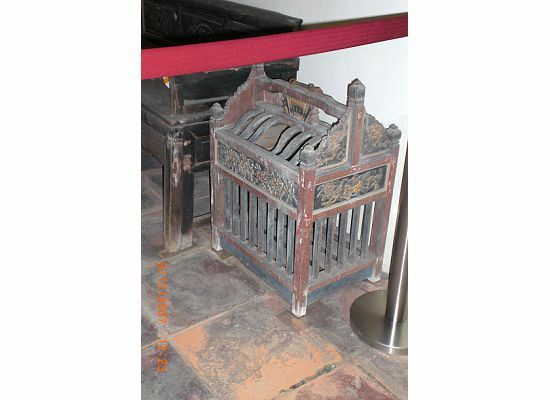 Next to the old furniture in the living room, is a cage for carrying chickens. It was mostly used before a Chinese wedding. On the right hand side of the living room, there is a bedroom with drapes on top of the bed to block the bugs. 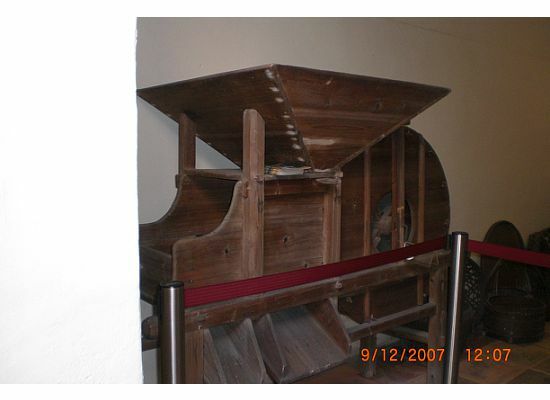 Underneath the bed, there is a earthen container. It is for rice. On top of it, there is a piece of red paper with 2 Chinese characters that have the meaning "always full". It is the Chinese customs symbolizing abundance. 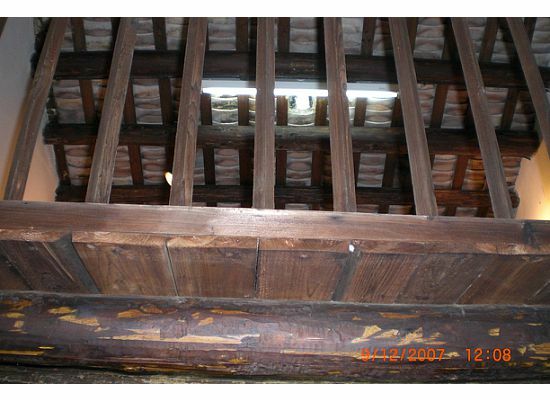 Raise your head, it is the attic. It can be for storage. But visitors would not be allowed there. Turn left, you will come into the kitchen and the dining area. On your right, is the stove top. 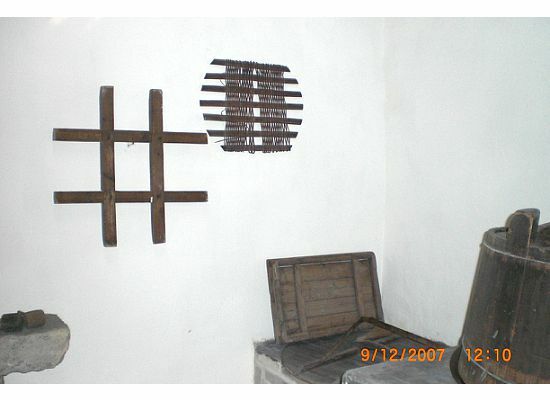 Next to the stove, there are some basic kitchen tools on the wall. On your left in the same room, is the dining table with some utensils, such as chopsticks, bowl, plate and wine bottle. 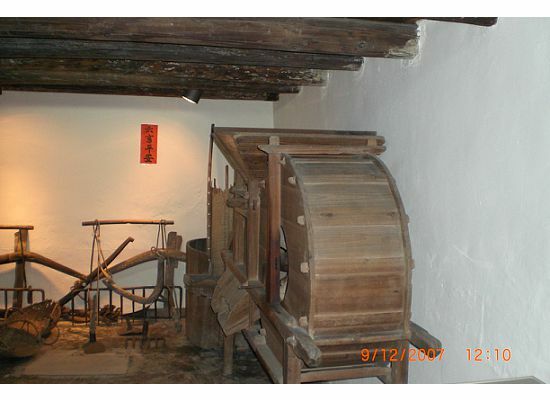 Keep going, here is another room where the farming tools, buckets for getting water out of the well and grinder are. Quite a equipment, huh? 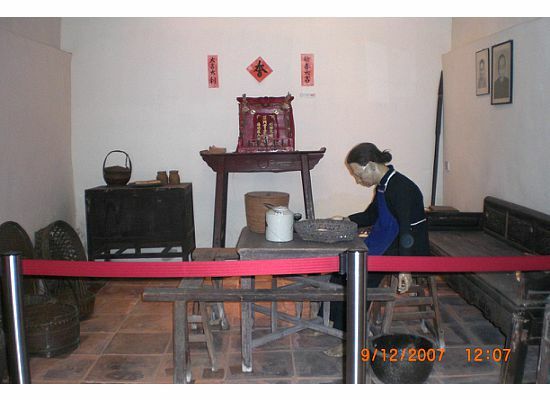 Comparing with the Hong Kong Tai Fu Tai Museum, there is nothing fancy in this house. Just by looking at the kitchen, you can tell the difference. Back then, that was how big the gap between the poor and the rich were. 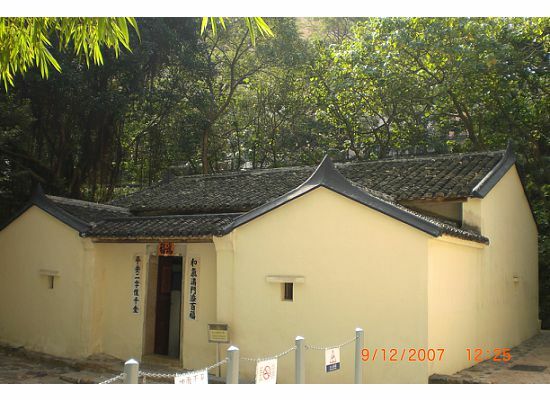 If you plan to visit the Hong Kong Museum of Coastal Defense and have extra time, stop by the Hong Kong Law Uk Folk Museum and check it out. Otherwise, I don't think, in my opinion, it is worth a special trip. Whatever you see from the pictures above, will be what you are going to see. I was not planning to check out this museum originally, but to have lunch with my sister 'cos she works nearby.